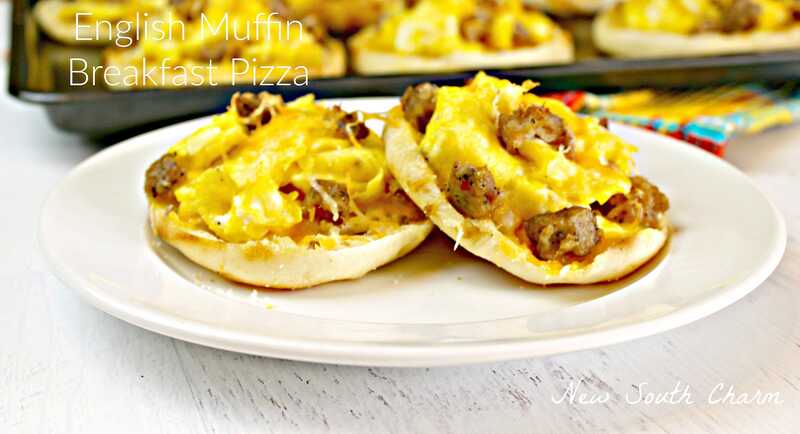 English Muffin Breakfast Pizzas only take a few minutes to prepare and you have a great breakfast for the week. You can also freeze these for months of hearty breakfasts. Some mornings eating a good hearty breakfast can be a challenge at my house. Some mornings there’s just no time for sitting down to eat. So, I don’t need to tell you that on those morning if it takes longer than 30 seconds to prepare it’s not happening. Days like these happen more often than I want to admit. Therefore, I’m always on the look out for fast breakfast recipes. 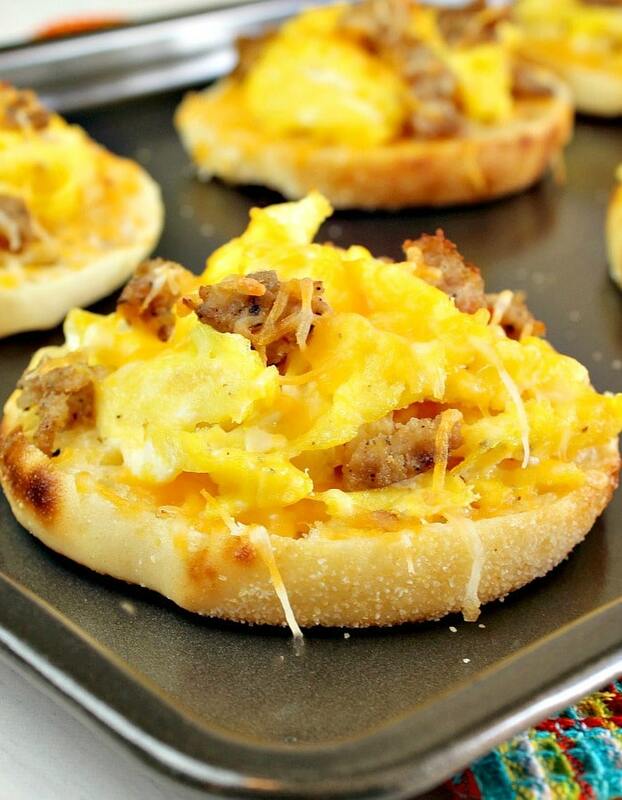 English Muffin Breakfast Pizzas are really easy to make and can be kept in the refrigerator for up to a week and the freezer for up to three months. Preheat oven to 350º while you’re waiting on the oven prepare the other parts of the pizzas. In a skillet over medium heat cook breakfast sausage crumbling it as it cooks. Remove sausage from skillet and set aside on paper towels to drain. 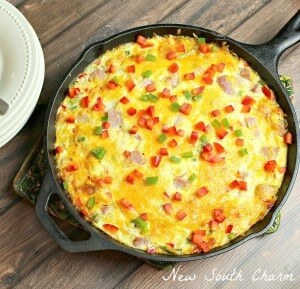 In the same skillet scramble eight eggs, seasoned with salt and pepper. When eggs are set in the middle remove from heat. Divide English Muffins in two and line them up on a sheet pan or cookie sheet. I recommend lining the tray with foil or parchment paper. This will make cleaning up faster and keep you from scrubbing cheese off the tray when doing the dishes. Melt four tablespoons of butter (I did it in the microwave) and combine with a teaspoon of garlic powder. Then brush the mixture over the English muffins. Sprinkle on Cheddar cheese, then stack on egg, and sausage. Repeat this for each muffin half. Sprinkle on more cheese. Bake at 350º for 10-15 minutes or until muffins are toasted and cheese is melted. If you are going to freeze these pizzas do not bake. Instead pile on the topping and wrap tightly in plastic wrap. Then store in a freezer safe bag. When ready to eat place them in the oven following the above instructions. These will keep fresh in an air tight container in your refrigerator for up to seven days. To warm them up just pop in the mircowave 30 – 45 seconds. 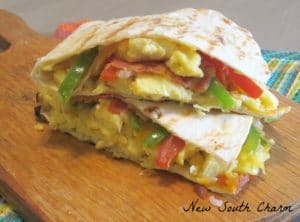 These are great for breakfast on the go so much better than anything I could get at drive through and less expensive too. Season eggs with salt and pepper and cook scrambling until middle is set. Remove eggs from heat. Melt butter the combine with garlic powder. Brush butter mixture over the bread. Sprinkle cheese on the muffin half then stack on eggs and sausage. Repeat for each English Muffin add more cheese to the top. If freezing stop here and wrap tightly in plastic wrap. Then store in a freezer safe back for up to three months. When ready to enjoy follow instructions below. Serve immediately or keep fresh in the refrigerator in an air tight container for up to seven days. Yummy! My little guy would really love these too! Thanks Carlee! We loved them I’ve made two batches in the last two weeks. They make such a great breakfast. Perfect for busy mornings. My kids will love them before school. I love these and I’m a grown up (most of the time, anyway). I hope you’ll give them a try and love them too! 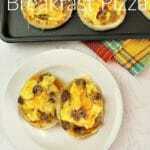 A great breakfast pizza and perfect for back to school! Hope you are having a fantastic day and thanks so much for sharing with Full Plate Thursday! I might have eaten a few of these myself. They are really good! So easy and a fun change for breakfast! Thanks for sharing with us at Throwback Thursday! I used to make English muffin pizzas with tomato sauce, cheese etc, but I love this wholesome and innovative idea! What a great way to make breakfast nutritious and much more appealing to kids (and adults alike!). Thank you for sharing this tasty breakfast with us at the Hearth and Soul Hop. Just a note to let you know I’ve featured this post at the Hearth and Soul Hop this week. Thank you again for sharing it! Thanks Susan! I love these myself. I guess I’m still a kid at heart. 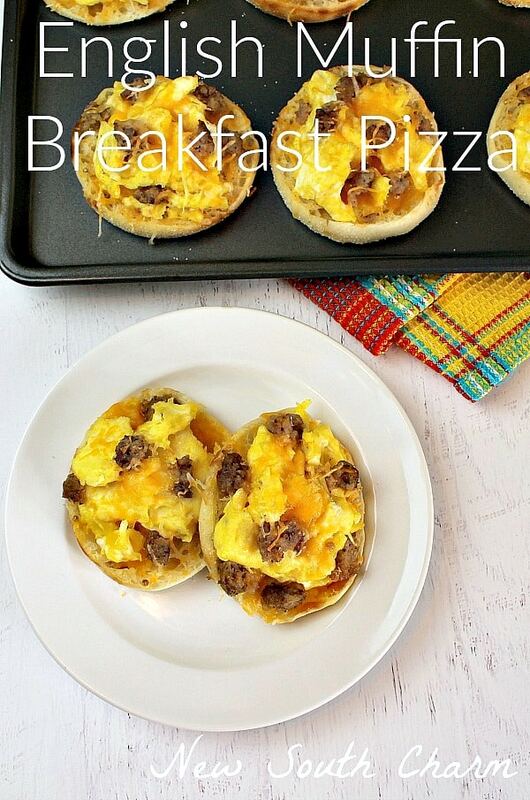 Susanne, these English Muffin Breakfast Pizzas look so fun. They also look really good. I love English Muffins, the sausage is a bonus and the cheese puts them over the top. 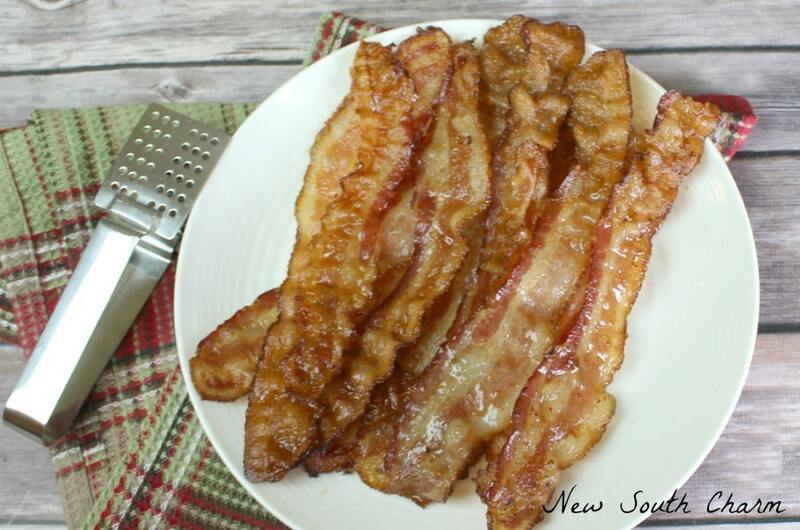 I’m sharing and pinning this recipe. Thanks for sharing it!